For a long while I had a obsession with fizzy drinks however over time I weaned myself off them. Slowly but surely I have gone back to drinking water and juice and have decided against drinking sugary drinks and energy drinks. 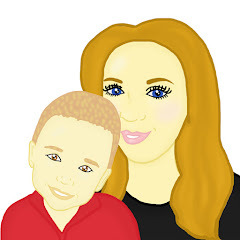 Since Maxwell has been born he has always enjoyed juice or water and has been stuck in his ways about what he wants to drink however recently he has started wanting to try different drinks. With the holidays and hot summer days around the corner I was excited to try the Infruitation bottles with Maxwell. Recently we were asked by Infruitation if we would like to try their bottles. For anyone that has not heard of Infruitation, Infruitation bottles are a smart way of staying hydrated. Opting out of buying expensive fruit juices along with expensive flavored bottle water, you are now able to make your own flavored drinks thanks to the Infruitation bottle. The Infruitation bottle is like a regular flask that your or your child are able to drink out of however there is a little extra. Inside the bottle there is a chamber which is large enough to house fruit, herbs or veggies. When you have added your required ingredient along with water, the ingredient releases its flavour into the water. Depending on what ingredient you use, the flavour can be as strong or as weak as you would like it to be. Because of this, it ensures you have healthy water. You are able to choose what ingredients you want in your drink and no sugars, chemicals or any other nasty ingredients are added into your drinks. Maxwell and I both decided on having strawberries in our bottles. We cut around 7 strawberries each and added them to the chamber of our bottles. 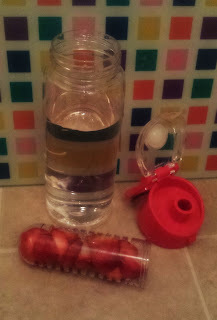 We found that we needed to leave the strawberries for over a hour in the water to start getting a good taste of flavoring in our water. Since trying the strawberries we have since had cucumber, raspberries and blackberries in our bottles however we have found that our favourite ingredient so far is the raspberries. The bottles are a great size to take to school, have at home or have on days out. The bottles come in a variety of colours which suit everyone's tastes. Maxwell has a red one and I have a yellow bottle however the bottles also come in the colours blue and green. 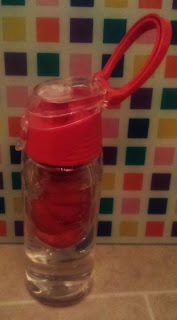 The Infruitation bottles have some great features which include having a leak proof lid. This is fantastic for younger children due to the fact they can often be clumsy and spill their drinks. The bottle is also dishwasher safe which in turn saves parents having to spend time washing their or their child's bottle up. If there was something that I could change about the Infruitation bottles, it would be the fact that the opening on the lid can get in the way of being able to drink out the bottle with ease and sometimes it can make it hard to drink out of the bottle. Although this is a small problem for me, it may not be a problem for others. Overall I think the Infruitation bottle is a fabulous creation. It helps and encourages me to drink healthier. By having one of these bottles, I am now always thinking of new ingredients to add to my water and I am feeling much healthier from drinking fruit/vegetable flavored water. The Infruitation bottle retails at £15.99 which I think is a reasonable price. You are able to purchase the Infruitation bottle from their website which you are able to find here. Thank heavens! I thought I was the only one who had trouble drinking out of these bottles, blaming my big nose etc. I gave up and now just chop fruit & veg & cram it into an ordinary water bottle ( a lot cheaper as well)! What a great idea - get rid of those added sugar 'flavoured' waters and get this bottle instead! Much healthier. I fancy trying out various herbs, hadn't even thought of that!